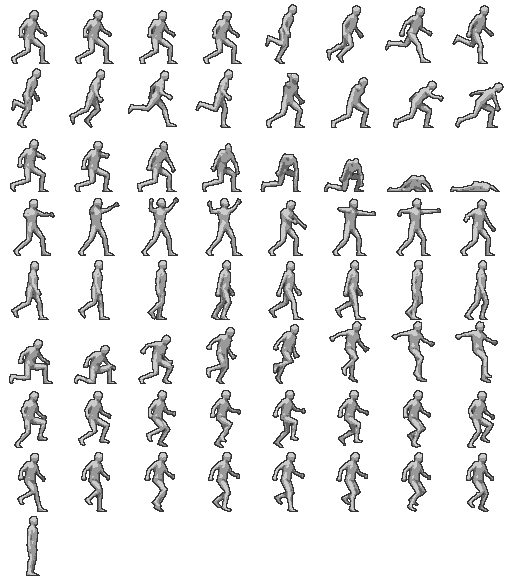 Base animations for an old school sidescroller platformer. Inspired by games like Castlevania and Ninja Gaiden. These can be painted over with pixel art to make PCs and NPCs for games. 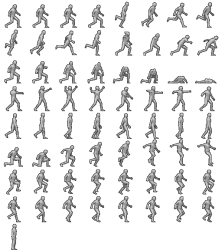 Each frame is 64x64 pixels. The scale is 32 pixels = 1 meter, and the hero is about 6 feet tall (about 1.8 meters). I turned the hero 15 degrees towards the camera, so we're not seeing a direct profile shot. (Updated) added a pixelized version of the output, great for a pixelart base. Could you fix it so that the run animation is not broken up across two rows. Plas the stance (4 frames) with the swing weapon (4 frames) and the run (8 frames) on its own row. is possible using this work for a html5 game ad supported? It's clear that your name will be inserted in the game credits. My name is Fabio, indie italian developer at bluevesselgames.tk, nice to meet you and congrats for your work! Fabio, feel free to use this work as long as you give me credit. I'll update this license to CC-BY. Wow thank you for this. I've been looking for a 'base' human to work on a game, but I wanted a jump, use weapon, bow, death, and run. Thanks for having all of these and more! I'm just wondering how you generated the pixelized look? I added a new animation using the blender model and now I can't get it to render how yours looks. Again, I appreciate the work and your help. Is there any chance of getting an update of this to include the female model?